Go ahead and preorder Watch Me Disappear because people are going to be talking about this one. I read this one in one day putting aside all my house chores and freelance writing stuff because I could not put it down. You will too. I am not one who loves thrillers or mysteries, but every now and then, a plot will catch my attention and I will give it a try. I am usually disappointed. 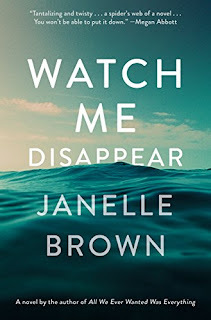 This was not the case with Janelle Brown’s Watch Me Disappear. The novel begins with a husband (widow?) and his daughter in present day reflecting on how their lives have changed in a year. It’s been a year since the wife/mother, Billie, disappeared on a hiking trip. Her body was never found. Jonathan is now writing a memoir of the events and Olive is struggling with the loss of her mother and teenage self-identity issues. But, then Olive begins to have visions of her mother asking her to find her. She introduces the idea that her mother may still be alive to her dad. At first, he does not believe, but then on his own searches, he stumbles upon one lie after another that his wife has hidden. Is it possible she disappeared on purpose? It is at this point when Jonathan’s love memoir begins to unravel as he realizes he might not have really known his wife. The author does a fantastic job of showing how memories get reconstructed after someone dies – and how we all create our own truths. The novel left me guessing until the last page – did she disappear? Was she kidnapped? Was she killed? If so, who did it? What was she lying about and why? In the end, I was firmly on Team Jonathan and Olive, and I was happy with the conclusion for their sakes. But, I do have one nagging question that I am dying to ask someone who has read it. Once you do, let me know and we can discuss it! * This book will be released next Tuesday (July 11th), but you may preorder this book from Amazon here. This post contains affiliate links. Thank you for supporting my blog!